Within the following text some information has come to me by e-mail from Richard W Holzman in Michigan, USA. Richard is a collector of information on 'all manner of exposure meters and calculators, 1839-1960'. I'm grateful to Richard for letting me use his information and I acknowledge this by a (RH) alongside certain statements. For those interested in the full long history and science behind exposure time calculators, I can recommend an article written by Chris Lord and appearing on his BrayeBrookobservatory website. It is entitled "Photographic Exposure Calculators - a History". To those interested in practical astronomy, Chris's site is an impressive mine of information, well worthwhile spending some time looking through. (RH) The first photo-electric exposure meter was advertised in 'Home Movies', October 1931 by J Thomas Rhamstine of Detroit, Michigan. Although there is popular belief that the Weston 617 was the first such meter, there were, in fact, three others before the Weston appeared in August 1932. Before that time, and until photo-electric meters were economically available, photographers had to rely upon their own judgement, or written guidance (simple tables), to determine the best f-stop and shutter speed combination to use when taking a picture. With so many factors to be taken into account viz: the speed of the photographic material, time of day, latitude, weather conditions and whether the subject was in full or partial shade etc, simple exposure tables did not satisfy the enthusiast. Hence, rotary calculators (or other form of sliding scale hand-held device) enabled a much wider range of exposure influencing factors to be conveniently taken into consideration. The advent of smaller negatives (culminating in 35mm), that needed increased printing enlargement, required the photographer to expose film with reasonable accuracy in order to obtain the best quality end result. With large format negatives, exposure accuracy was less important so long as the photographer always erred on the side of giving too much, rather than too little, exposure. Colour photography, from the late 1940s, further emphasised the need for exposure accuracy, especially when exposing colour transparency or cine film, and this led (by the mid-1950s) to the appearance of cameras with built-in photo-electric exposure meters and, by the early 1960s, to cameras offering fully automatic exposure control. 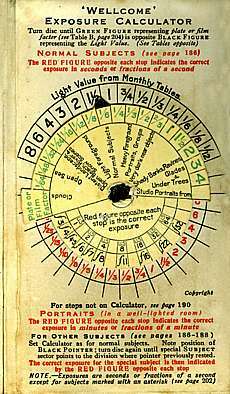 The "Wellcome Photographic Exposure Calculator, Handbook and Diary" contained, from its earliest times and as its name implies, an exposure calculator (working on the rotary principle). Although the calculator occupied just one page (the inside back cover), its use was quite sophisticated (as befitted the enthusiast who would own a Wellcome diary) and required several pages of accompanying text and illustrations to explain its full versatility. The Wellcome calculator shown alongside comes from the 1937 edition of the Wellcome Photographic Exposure Calculator, Handbook and Diary. By the time Johnsons took over publication of the Wellcome diary, Wellcome had added a second rotary calculator, this being to determine the depth of field available (distance between foreground objects and more distant ones, maintaining acceptable sharpness). Presumably Johnsons maintained this format initially, but since most cameras by the 1950s had scales around their focusing mounts indicating depth of field, Johnsons must have decided that the depth of field calculator was of little practical use and changed the second calculator for a further exposure calculator. The first, No.1, was then dedicated to negative material (B&W and colour) and the second, No.2, was for reversal (transparency slides & cine) material. 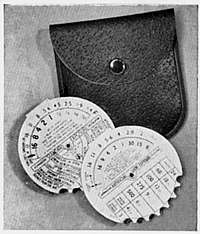 In late 1946 (RH) Johnson & Sons, Manufacturing Chemists Ltd, began marketing a 'British Standard' (to BS 935/1941) 6.5cm diameter rotary exposure calculator made of 'ivorine', a plastic which simulates the appearance of ivory. It was reviewed in the 4th December 1946 issue of the British Journal of Photography (BJP) on p132. "Packed in a stout envelope, with full instructions, the price is 4s/2d (21p) including Purchase Tax" (PT). The full review is viewable here together with the Johnsons advert in the 1947 BJPAlmanac (p47). Click here, or the pictures, to see an enlarged image. A version for the Southern Hemisphere was also available. Instructions for the Artificial Light calculator, plus the BJPA 1949 review, are shown here. The Johnsons of Hendon advert in the 1949 BJP Almanac shows that the Standard calculator had then been joined by an Artificial Light Calculator of similar appearance. By the early 1950s they were priced at 3/- each (15p) or could be purchased as a pair, in a 'neat plastic leather grained purse with press-button fastener' specially made to hold the two calculators, price 8/- (40p). Of course, there was nothing novel about these calculators. Many organisations supplied some form of exposure calculator and the rotary format was quite common. Ilford marketed such a device from as early as 1896 (RH). 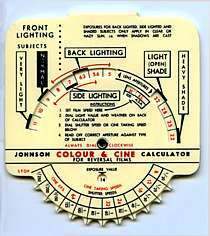 Contemporary to the Johnson calculators, the 'Focal Press' supplied a neat 3-fold exposure guide with a rotary calculator which included advice on stage, flash, night time, artificial light, indoor daylight and colour photography. It had many reprints. Major film makers supplied, free of charge, simple pocket exposure guides, often laminated to improve their resilience. Indeed, for many years the instruction leaflet packaged with films contained a guide to exposure that was perfectly adequate for most outdoor subjects in daylight. Special guides were published for events like bonfire night (5th November) and street scenes of Christmas decorations. They encouraged people to use their cameras under more unusual circumstances and this was good for product sales. The next level of sophistication after exposure tables and sliding or rotary calculators was the simple 'visual' exposure meter, where the subject was viewed through semi-transparent material of varying degrees of darkness. When a number printed on the viewing material could be distinguished against the subject, that number gave an indication of subject brightness and, hence, the required exposure. 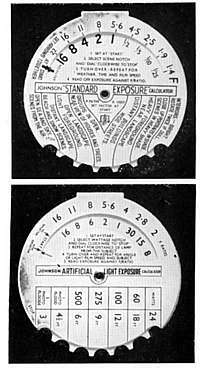 Johnsons sold their own version of this type of exposure calculator at the same time as their rotary versions. It was called the 'Perfectus'. Around 1955 (BJPA entry), a third rotary calculator was added to the Johnson range, being the 'Flash' calculator, also priced at 3/- (15p). An original advertisement for it can be seen here. It looked and operated much as the ones illustrated above and indicated the 'f stop' required at various distances with all types of flashbulb. By 1955, cameras with shutters synchronised for flash were becoming common-place, though the UK hadn't quite standardised on the German 3mm coaxial PC (Prontor-Compur) fitting that became universal by the end of the decade. 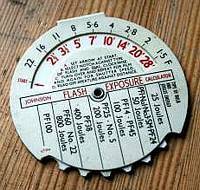 The Joule ratings on the Flash Calculator suggest it was also intended for electronic flash, though electronic flash equipment was bulky, heavy and expensive, hence rare for amateur use in the mid-1950s. 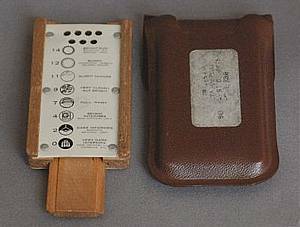 Click the link to view the later (1960) version of the 'Flash' Calculator, together with its packet and instructions. The next addition came in 1958 with the 'Colour and Cine' calculator, but this was of a new, slightly larger and squarer form (7.5x8cm). Calibrated in accordance with the British Standard Exposure Tables B.S.935: 1957. It was priced at 4s/6d (22.5p) while the other three, still of the circular shape, remained priced at 3/- (15p). For use with all types of colour reversal film in still or cine cameras, and also suitable for calculating exposure with black & white reversal film. "Gives correct exposure under all daylight weather conditions at any time of the year." Calibrated for latitudes 45º to 55º North, it was supplied with a set of light value tables for other latitudes which the owner could cut out and stick on, as appropriate. Click here, or on the image alongside, for an enlarged view, front & rear. Also to read the instructions, see the alternative light value / latitude tables and see the BJPA review. By 1959, the Artificial Light calculator had been revised to the same square shape as the newly introduced Colour & Cine Calculator. 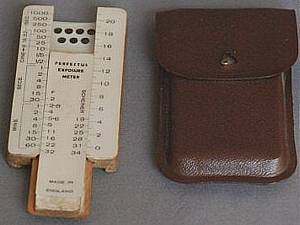 Then, by 1960, all four of the Johnson exposure calculators had been revised to the same squared shape. Johnsons of Hendon had a full page advertisement in Amateur Photographer magazine 15th June 1960 edition, showing all four. They were then all priced at 4s/6d each (22.5p). A pdf file showing how all four were advertised in the Johnson General Photographic Catalogue of 1960-61 can be seen by clicking here (courtesy of Richard W Holzman). By 1965, the price of each had increased to 5s/6d (27.5p). By Spring 1968, only the two of the Calculators were still being marketed. These were labelled as 'Colour Film' (Johnsons said it could also be used for Cine) and 'Standard Daylight' (for black & white film). They were priced at 5s/6d (27.5p) each. The table alongside is taken from the 1955 book entitled "Newnes Photographers' Pocket Reference Book" published by George Newnes Ltd, Tower House, Southampton Steet, Strand, W.C.2 (i.e. London, UK). It conveniently shows speed conversions for not only the 'Wellcome' rotary exposure calculators (prior to those calculators being taken over and used within the Johnson Year Book) but also shows the Ilford Group speed system. 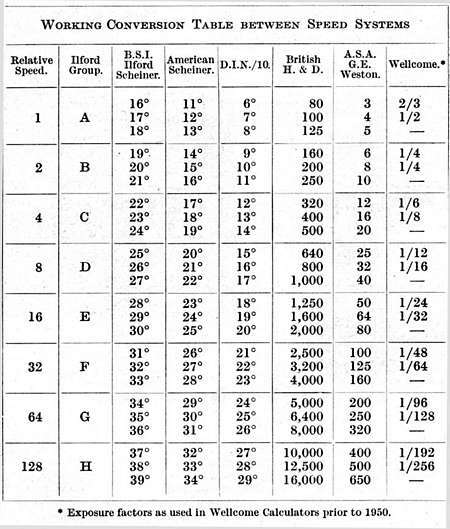 The Weston speeds in this table are shown as being the same as ASA (ISO) speeds, but the earlier Weston meters (up to Model II) had their own Weston speed system which was later (in the Weston Model III & subsequent) 'converted' to ASA, by the formula 'Old' Weston = 0.8xASA = 0.8x'New' Weston. The Weston Model III, with its ASA film ratings, first appeared in 1956 (RH). It was reviewed in Popular Photography magazine in June 1956, as can be seen here. Note that this is a US publication. Doug McKee tells me "the illustration is of an American Weston Model III. The UK versions of the range were cosmetically different, and later, than their US equivalent." For another comparison table see below, from November 1961. "I notice that from time to time you publish tables giving the equivalents of the various film speed systems. My own particular query concerns (the Russian) Gost but an idea would be to give a sort of "master table" comparing all the systems and so kill several birds with one stone!" sent by R.J of Chelsfield, UK. "Your suggestion has been acted upon and I hope everyone will cut out the table for reference and so save themselves future trouble! Of course, it must be realized that, with the exception of ASA and BS the systems usually measure slightly different properties, so absolutely exact comparison figures are impossible. However, the figures given are near enough for all practical purposes. The ASA and BS figures are in the old or "uninflated" system. Approximations have been used where required and Scheiner can be considered as being the same as BS log".